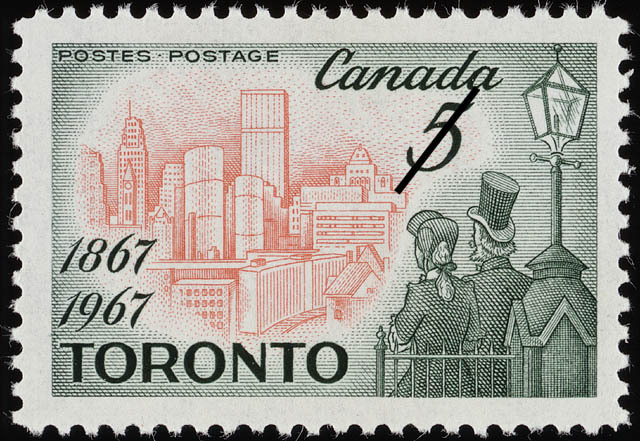 The value of a Toronto, 1867-1967 - 5 cents 1967 stamp depends on several factors such as quality and wear, supply and demand, rarity, finish and more. Values in the section are based on the market, trends, auctions and recognized books, publications and catalogs. This section also includes information on errors and varieties and characteristics. The 100th year of Toronto as seat of the Legislature for the Province of Ontario is commemorated by this stamp issued by the Canada Post Office. The site of Toronto had been of strategic importance from the beginning of Ontario's recorded history. Historians say that a small French trading post, which lasted about ten years, was located in the same vicinity in the 1720's. The area was on a trading route known to the Huron, Iroquois and the Chippewa Indians, a route used by Brulé, La Salle, Dulhut and others. The general area is known to have been the site of villages built by the Senecas and the Missisaugas. In the late 1700's, the Governor in Chief, Lord Dorchester was aware of the site's potential, therefore in 1788 a surveyor was ordered to lay out a town site. Dorchcester's plans, however, did not materialize. It remained for Lieutenant Governor Simcoe, arriving in 1793 with his family and men of the Queen's Rangers, to rekindle development of the area. In the same year, Simcoe christened the town York, after the Duke of York; York remained the name of the town until its incorporation as the City of Toronto in 1834. As early as 1804 there was a movement to restore the name of Toronto, indeed it is recorded some families persisted in the use of Toronto throughout the period when York was in use. The origin of the word Toronto is uncertain but it is said to have originated in the Huron region, to which Toronto was the natural gateway. Spelled in various ways, it was applied to larger areas of Ontario including the whole secton of land between Lake Simcoe and Lake Ontario. The name Tarantou appears on a map produced in 1656, another version is that the word derives from Atironta, Chief of the Arendaronons. Prior to Confederation in 1867 the area figured prominently in the affairs of Upper Canada, but it was not until 1796 that Government officials were ordered to move their offices from Newark (Niagara) to York. The first parliament in Ontario had been in Newark from 1792 to 1796. Simcoe had at one time thought the Capital should be London, on the River Thames; he saw York as an arsenal, not a Capital, but he decided Kingston and Niagara were both too close to the American Border for safety. An ironic sidelight in later history is that in 1813 American forces landed in the area now known as Sunnyside Beach in Toronto. Seizing the fort, they burned the archives, put the torch to government buildings and made off the parliamentary mace. In reprisal, the British forces occupied Washington where they set fire to the public buildings and the president's mansion. The mace was restored to the Provincial Government by President Roosevelt in 1934. The Honourable John Sandfield Macdonald served as Ontario's first Premier following Confederation in 1867. The question of erecting new parliament buildings was raised in 1877 and in 1880 an initial grant was made toward their construction. Work commenced in 1886 and 6 years later, at a total cost of $1,300,000, the building was practically completed. A formal opening of the new seat of government took place on the April 4, 1893. The architect for the massive structure was R.A. Waite, a native of England and at that time a resident of Buffalo. Ontario's legislative buildings, to which additions have been made through the years, are known to many as Queens Park. The structure stands in the mid-city oasis of Queens Park, an area purchased by King's College in 1828 for $16,000. In 1859 the Park was leased to the City of Toronto for 999 years. At the time of the War of 1812 York's population was estimated at 800.